I love to read: novels, history books, magazines...pretty much anything I can get my hands on. As a result, I'm always looking for more space to store books. Recently, I have noticed that bookcases are becoming more and more creative. No longer do books have to reside on a simple set of wooden shelves. I was most intrigued, and surprised, by the bookcases made of concrete. I had never thought of this possibility before, but it appears that quite a few others have. 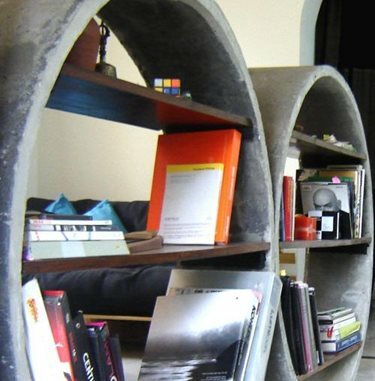 Precast concrete rings were used to create this bookcase. Fiber cement is used to make the modular JOHNNY shelving unit from Karacho & Bros. The first concrete bookshelves I discovered come from Kamat & Rozario Architecture, a firm in India. They used precast concrete rings, normally for building underwater tanks, to create large, circular bookshelves. Two concrete rings were bolted together, and then stained plywood was added for shelves. Next, I stumbled upon Francesco Passaniti, a French entrepreneur, painter, designer and sculptor, who makes just about everything out of concrete. With his work, Passaniti strives to abolish the many misconceptions about concrete, including heaviness, ugliness, sadness and brutality. 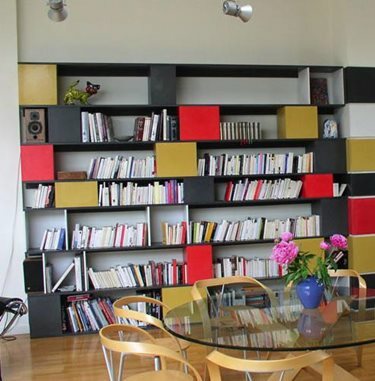 He has an entire line of concrete bookcases that are anything but heavy, ugly, sad or brutal. 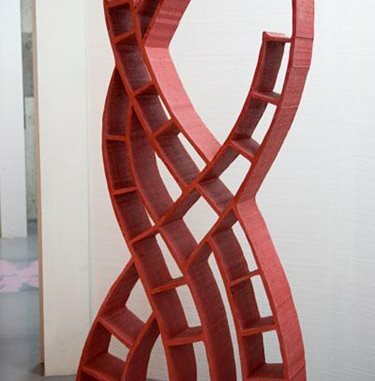 I especially love the curved lines of his TREE bookcase and the bright colors of his ELLEN L.
TREE bookcase in red from Francesco Passaniti. ELLEN L bookcase from Francesco Passaniti. 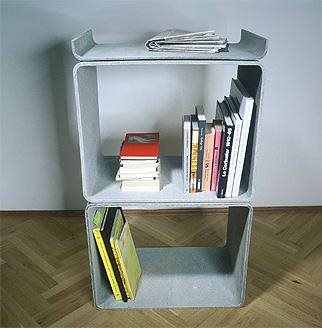 Finally, I found a simple fiber cement bookshelf, entitled JOHNNY, from German designer Karacho & Bros. It has a modern, cube design featuring modular units that can be arranged in any fashion. The shelves are 35 cm deep, which provides plenty of space for books of any size, or even your record collection. Multiple JOHNNY sets can be combined to create additional storage space. I would love to house my expanding book collection in any of these concrete bookcases. It seems that once again, concrete has proven its flexibility as a functional design element.